Natural Selection 2 developer Unknown Worlds is nothing if not ambitious. 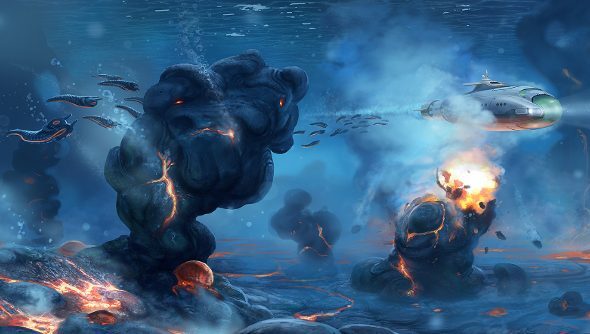 Today the studio announced its next project: Subnautica, an underwater exploration and construction game that merges elements from RPGs, sandbox exploration titles and cinematic games. Unknown Worlds believes they’ve gone and created a brand new genre. Players will be able to build their own submarines and equipment, assisting them as they go further into the unknown, while trying to deal with the hazards of this underwater realm. Unknown Worlds has already posted a bunch of absolutely lovely concept art and a few atmospheric audio tracks to warm your eyes and ears, so go check out the blog. Fans of Natural Selection 2 need not worry that this new project will detract from Unknown World’s other game. A seperate blog post details the impact Subnautica’s development will have on Natural Selection 2: it won’t affect it at all. “What does Subnautica mean for NS2? Does it mean that NS2 will stop getting love and attention? Is Unknown Worlds abandoning NS2? Absolutely not! Subnautica will have no effect on NS2, and all planned NS2 work will continue untouched.